Well, pretty much like everyone else: Very carefully. She puts together a plan. She counts the cost of supplies. She counts the cost of her time. She sets her price per product. She determines if the business is viable. We knew we wanted our kids to have life-experience from an early age, but there are few businesses – read none – who will hire an 8 year old. We just needed a way to do it. Enter the Home-Based Business. By taking an often-complex business planning template and boiling it down to easy-to-understand-yet-still-effective steps, we were able to walk the kids through the planning process to determine if a business idea was viable (profitable, worth our time and effort, do-able). The world of family business is an unlimited realm. Worm Farming, and everything in between. having thought of something to do. WHO? Students, ages 12 and up. This qualifies as 1 High School Credit. Weekly assignments delivered via Email to keep the students progressing toward their goal of opening a business. We will meet via Google Hangout twice a month in groups of 5-9, to discuss ideas, progress, and roadblocks, and to build community among the students. Opportunity to Complete Business Plan and open Business before the end of the semester. Geared toward Adults and Adults leading their family to start a new business or grow an existing business. 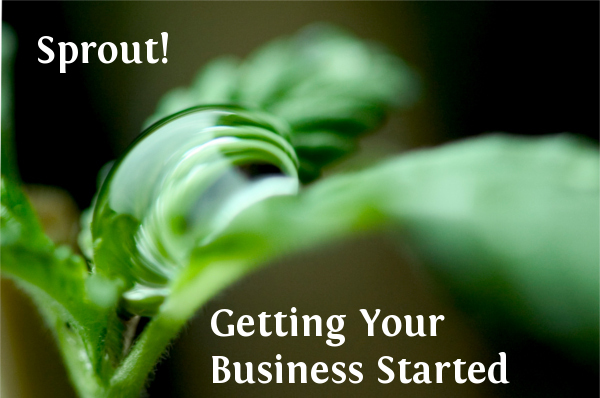 Faster paced Business Planning developed so that you can start working your new business in as quick as 5 weeks. Weekly Meetings via Google Hangout with Facilitator and others in the course to discuss progress, glean ideas, share struggles and set new goals. We are a regular family who has the knowledge and experience of helping our own children start their own businesses at 8 years old, and growing and expanding each year. We have developed our own home-based ventures that have supported our family and built in us the desire to see other families bring work-life back home. In our house, we are busy! Our kids, Lance is 15 and Charla is 17, each began their first business at 8 years old. Now they each manage 2 different businesses, and help out with our Family Flagship: Family Business Greenhouse. Lance takes Lucy for a swing. 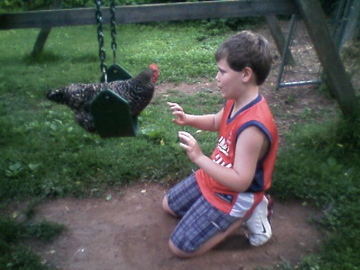 Lance is a chicken expert. 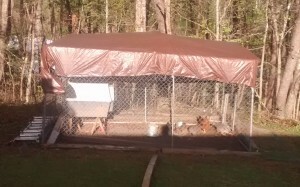 Lance started his chicken flock at 8 years old, and has been growing his flock and his knowledge ever since. He has spent the past 7 years reading and studying everything he can lay his hands on about his birds. He serves as a coach to folks who want to start their own backyard flock, helping with ever ything from determining the breed of hens, to how to construct, and where to place the coop. He also flock sits. If a family is going out of town for a week or a weekend, Lance tends their flock twice a day to ensure the hens’ health and safety. the sweat of your brow! WHEW! Charla found that purses that had embellished pockets sold best. Charla likes diversity! She started out making purses and aprons from old jeans. 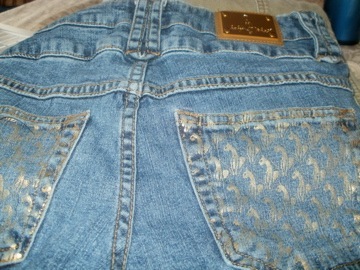 The most basic sewing skills + $1.00 jeans = $120/month. Not Bad for an 8 year old! Once the aprons and purses became more popular, the demand became greater and greater… leading her to really dislike sewing. You might think that would be a negative outcome. It wasn’t. It caused her to really think through her next venture, to find something something she could grow with and not do the same thing over and over. Now she has a Gluten Free baking business and is a Care Taker for an elderly couple. She cooks health meals, does the grocery shopping, keeps things organized and helps her with Physical Therapy exercises. This last thing has sparked in her an interest in pursuing Physical Therapy in college. As Business Owners, our kids keep their own books, pay their own salary, reinvest their money as needed, maintain their inventory, etc. We developed Age-Appropriate Templates for them to keep up with these things when they were young, and have adjusted these as they have matured and their abilities have increased. 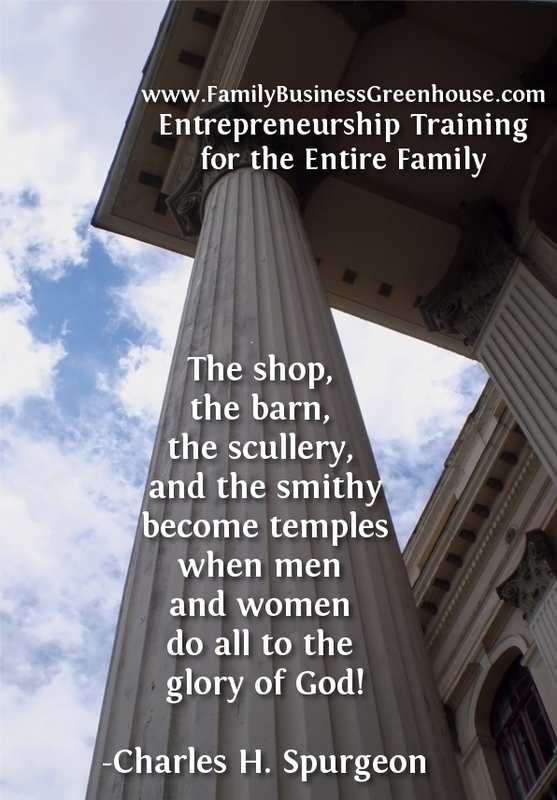 We make these templates available to Family Business Greenhouse participants – of all ages and abilities. Business doesn’t have to be overly complex. It is doable, achievable and success-able. You just have to jump in. Work is not a curse that was handed down as a result of the fall of man into sin. As we see in Genesis 2:15, work is a part of God’s original design for men and women, “The Lord God took the man and put him in the garden of Eden to work it and keep it.” In Genesis 2:18 it is recorded,”Then the Lord God said, ‘It is not good that the man should be alone; I will make him a helper fit for him.’” God gave Adam a wife, Eve, to be his helper. A helper is someone who works alongside.